One flight attendant went above and beyond to help out a frazzled new-mom passenger—and her actions left an impression that lasted long after landing. Heather Gooch was understandably nervous about flying with her 9-month-old son, Aiden. It was only the second time Aiden had ever been in the air and the first time he'd ever been awake on a flight—but thanks to a special flight attendant, Aiden's second flight was a success. "I was so nervous," Gooch told ABC News of the experience. "The flight attendant was so helpful, she carried our bags for us and brought us to a seat where she knew there would be an empty seat next to it." Aiden started to fuss once the flight began. "After we took off he started getting fussy and people were looking at us and I thought 'oh great,'" Gooch said. "She caught my eye and she said 'do you mind?' and picked him up and walked him up and down the aisle. [Aiden] was waving to everyone." Gooch remembered the flight attendant's name and called Southwest Airlines to praise her service. Gooch got tired of waiting on the phone listening to a busy signal (girl, we've all been there) and decided to reach out via Facebook instead. The post has gone viral, with users sharing and liking the photo. Gooch's efforts paid off: The flight attendant did see the post. She even came back with a comment: "'Y'all are going to make me cry!!! Lol it was Truly my pleasure and he made MY day!! I needed him more than he wanted me to hang out with! Lol you know, since I can walk and all! 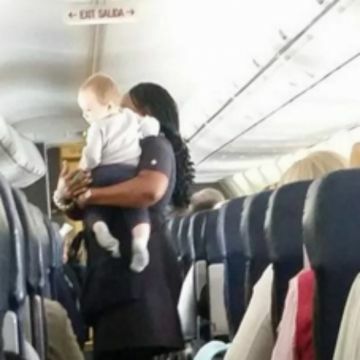 Lol I don't mind being used by the babies lol," the flight attendant, who goes by Anissa Brownsugar Charles, wrote. She followed up with another comment, writing: "'I tell adults all the time on my flights, children are doing exactly what they are supposed to do...make noise! Lol Think about it, the aircraft is completely boring to them (after takeoff) and there's nowhere to run! I would honestly rather hear them make noise and even cry than to hear an adult whine! Lolol They have soooooo much to talk about and mom and dad deserve a break!" Amen to that. Thank you for your wonderful service, Anissa! And thanks to Heather Gooch as well—we're certain the amazing flight attendant won't forget your gratitude.